“About Like So: The Influence of Painting” is a group exhibition that explores how the histories, forms, materials and other qualities associated with painting inform conceptual art practices today. The show is on view at Franklin Street Works from November 22, 2014, through February 22, 2015. The works include sculptures, videos, photographs, sound installations, and digital prints. Loose and disjointed narratives involving the histories and materiality of painting are found in several videos: Ragnheiour Gestsdottir’s video “As If We Existed,” portrays the fictitious melodrama of a figurative painter working in Venice; Tameka Norris’s “Purple Painting” incorporates makeup and food in a provocative video that, with few words, touches on issues surrounding race, gender and the pressures of an art historical canon; in Alex Hubbard’s video “Hit Wave II,” a magician gives instructions for tricks, but the sounds and activities surrounding him allude to action painting with Hubbard in the background wearing a paint suit and creating gestural marks with spray paint. Sculptures by Brad Tucker, Dave Hardy, and Taylor Davis also show painting’s influence. In one of Tucker’s box sculptures, “Potholder,” he incorporates a homemade-style woven potholder that mimics mid-century, shaped abstract painting while crossed bars in the box’s back reference hanging devices (hooks, wires, D-rings) usually hidden by the museum wall. In his sculptures, Dave Hardy uses pigment, cement-infused foam, glass, metal and other materials, combining them so it seems as though abstract wall works have sprung into three dimensions in the form of sophisticatedly constructed sculptures that intentionally appear unwieldy or precarious. Taylor Davis’s “TBOX No. 1” sculpture is a small double-stacked construction of birch plywood that sits directly on the floor and appears to have blue painters tape marking it with lines and arrows. In reality, the “tape” is painted on, creating an optical illusion that conjures trompe l’oeil painting. A handful of artists in the exhibition reference particular art historical figures or classic painting genres. In Paul Branca’s “Untitled, for Rodchenko,” he combines monochrome paintings in the style of Alexander Rodchenko with tote bags and tags. Sophy Naess’s gestural soap pieces began with a prompt to respond to abstract expressionist Hans Hoffman’s work. Composed of body friendly materials, scents, and pigments, these pieces address the fraught painting subject known as the bather. In their version of TV painter Bob Ross’s show “The Joy of Painting,” Peter Nowogrodzki and Max Kotelchuck’ YouTube video follows Ross’s instructions to make a landscape painting using a computer program rather than paint and brush. Polly Apfelbaum’s abstract fabric sculpture, “Split Station Stop,” hangs from the ceiling and was inspired by her stay in Rome with its abundance of Catholic-themed artworks, specifically the Stations of the Cross. In Tim Davis’s “Permanent Collection” series he takes photographs of classic paintings ranging from still lifes to religious, using the light of the camera’s flash to obscure bits of the composition and/or bring surface qualities, such as brush strokes and crackling, of the physical object to light. 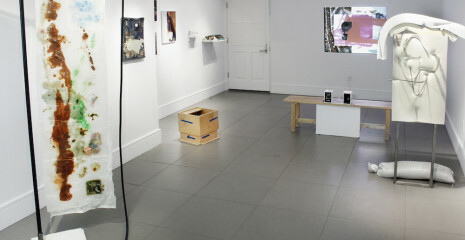 Computer generated works by Seth Price, Paul Theriault, and Siebren Versteeg incorporate canned digital effects, flat bed scanners, and Google image search respectively. With Seth Price’s “Digital Video Effects: Spills,” the artist layers digitally imposed black “spills” that ebb and flow over artist Joan Jonas’s video featuring a conversation on the commercialization of art between art dealer Joseph Helman and conceptual artists Robert Smithson and Richard Serra. Paul Theriault paints directly onto scanner beds and then scans the composition, allowing for the occasional burst of scanner light to peak through the “painting.” Siebren Versteeg enters his algorithm paintings (abstract paintings produced using code) into the computer and prompts a Google image search to find a “concrete” image, which is hung just to the right. Rather than taking a realistic image and abstracting it, the computer conjures representational images based on an abstract composition, turning the usual dynamic between the representational and the abstract upside down. Paintings are also included in the exhibition, but the artists use strategies that challenge our expectations of painting’s forms or the artist’s role as author. In Leslie Wayne’s “Paint/Rag” series, the artist plays with perception and a linguistic idea that’s embedded in the title (paint – slash – rag) by removing the layered paint off of one support and draping it over another, making it appear as if it were hung on a hook like a piece of fabric or an ordinary rag. John Knuth’s abstract paintings resemble the splattered layers of a Jackson Pollock painting, but are the result of Knuth relinquishing authorship to a business of flies that excrete the paint he feeds them onto paper. Obscuring elements of a book with paint to reconfigure artist books, Marley Freeman inserts abstraction that, much like an analogue companion for Price’s video, obscures and highlights texts and images in these artist books, in part, as a commentary on painting’s decorative associations and the influence of modernism on the medium. Polly Apfelbaum, Paul Branca, Taylor Davis, Tim Davis, Marley Freeman, Ragnheiour Gestsdottir, Michael Graeve, Dave Hardy, Alex Hubbard, John Knuth, Sophy Naess, Tameka Norris, Peter Nowogrodzki/Max Kotelchuck, Seth Price, Paul Theriault, Brad Tucker, Siebren Versteeg, Augustus Thompson, Leslie Wayne, and “in actu: music & painting” (K.R.H. Sonderborg, Wolfgang Hannen, Günter Christmann and Paul Lovens).